As many of you know, Mark had a heart transplant in January 1995. In order to keep his body from rejecting his new heart, he has to take immunosuppresants (anti-rejection drugs) everyday. Unfortunately, there are side effects. One of them is their toxicity to the kidneys. (He has to take these drugs to stay alive. There is no alternative.) In June of 2006, Mark’s kidneys failed as a result of these drugs. Currently, Mark has “End Stage Renal Disease.” (ESRD is also known as End Stage Renal Failure.) This requires him to be on dialysis. He goes 3x a week for 3 hours a session and is doing really well on dialysis. He has a great attitude! Truly, Mark is a survivor! He has worked very hard to adjust to the lifestyle and dietary changes. He has lost close to 40 pounds too! In the middle of March, he completed his semi-annual exams at StanfordHospital, as a routine follow up from his heart transplant and as a requirement as a kidney patient. I am happy to report that he got glowing reviews on the health of his heart and arteries. As a result of this, he is now an active candidate on the kidney transplant waiting list. Alas, the list is long! For his blood type (A+) it is 4-6 years, in our area. Transplantation is a very costly operation and there are huge costs associated with dialysis as well as aftercare, co-pays etc. To help Mark with the financial burdens not covered by insurance or Medicare we have established a fund raising campaign with HelpHOPELive. They are a nonprofit organization that has been helping the transplant community for over 30 years. Scroll down to see why I chose HelpHOPELive. Please also take a few minutes out of your day to look at the other sites listed below. Besides the fund raising objectives, my goal in posting this web page is to raise awareness about renal disease and let you know how Mark is doing. If you have any questions not answered below, that are about ESRD or dialysis in general, please check the websites I have listed. If you have any questions that are more personal about Mark, please, please direct them to me at 831-212-6593 or [email protected] Do NOT call Mark with a lot of questions! It is too overwhelming for him. Calling, or better yet, writing to Mark to say hi and we are thinking of you is fine. You can write to Mark via my email. I will send you our mailing address too, if you like. I am your contact and point person and happy to answer any questions. I have learned a lot in the past 10 months about ESRD. If you are inspired to do so, contributions for Mark can be sent to HelpHOPELive via check or credit card. Instructions and FAQs follow. Contributions for Mark may be made by check or credit card. Be sure to note in the memo of your check “In honor of Mark Koenig.” Make checks payable to: HelpHOPELive. Mail to: HelpHOPELive, Two Radnor Corporate Center, 100 Matsonford Road, Suite 100, Radnor, PA. 19087. For credit card contributions call 800-642-8399 or select the DONATE NOW button. Please know that your contributions count! All contributions are tax deductible and are administered to transplant related expenses only. Amy Rubinoff is our Patient Services Coordinator, but everyone there is very helpful. You can also google Dialysis or Kidney Disease or renal failure and find plenty more. Please do your best to inform yourself. It will help me to better answer questions for you. Because this is a highly emotional and personal situation and it was Mark’s wish to keep things private. And, frankly we did not have enough information until now to make this public. What is dialysis? Dialysis is a type of renal replacement therapy which is used to provide an artificial replacement for lost kidney function due to renal failure. It is a life support treatment and does not treat any kidney diseases. Dialysis may be used for very sick patients who have suddenly lost their kidney function (acute renal failure) or for quite stable patients who have permanently lost their kidney function (end stage renal failure). Are there any alternatives to the wait list for transplantation? Yes, Living Donation is when someone volunteers to donate a kidney to a recipient like Mark. If you are interested in learning more about this because you think you might want to donate, you should know that Mark is being treated at Stanford Hospital. They are a very conservative institution with respect to transplantation. They require that you have a “significant” relationship with Mark before they will even consider evaluating you. Your BMI (Body Mass Index) must be below 38%, the lower the better and you must be a matching blood type. Mark is A+. He can accept A+ or O+ organs. You must also contact the living transplant coordinator yourself. Her name is: Tania Makki. Her phone number is 650-725-9891. Her fax #is 650-723-3997. You will be evaluated physically & psychologically. Mark’s insurance will completely cover your costs as a living donor. You can expect to be under care in Stanford hospital for about a week. What modality is Mark on? Mark goes to Satellite Dialysis Center in Santa Cruz for hemodialysis. His access is through a fistula in his right arm. The team there is great! Besides learning as much as you can by researching on your own and taking care of your own health: Please spread this information to anyone who knows Mark and let me know who I may have missed. I would also like all of your email addresses, (if you did not receive an email from me, I do not have it.) This helps me stay in touch with you easily. of course, your donation helps too. Please let me know if you are interested in helping with fund raising events. These are still a ways off; but when the time comes, I know I will need some help coordinating everything. Why donate through HelpHOPELive instead of directly to Mark? We have chosen to fund raise with HelpHOPELive (formerly NTAF) in part because HelpHOPELive provides both tax-deductibility and fiscal accountability to his contributors. Contributors can be sure that funds contributed will be used only to pay or reimburse medically-related expenses. Additionally, your donations through HelpHOPELive are non-taxable income for Mark. He gets more of the money this way. I have investigated setting up a separate fund and this is the best way for us to raise NON TAXABLE funds for Mark at this time. You can learn much more about the additional benefits and support HelpHOPELive provides us, (you and Mark and myself) by spending time on their website. Please, understand that this is a big benefit for Mark and they assure your donations only go to appropriate reasons. Please don’t be afraid because you are writing a check to HelpHOPELive, just be sure you write Mark Koenig in the memo and it will all go well. I will contact you all if we find another avenue that serves Mark as well as HelpHOPELive does. From HelpHOPELive:Mark Koenig is raising money to pay for his uninsured medical expenses associated with his kidney transplant. 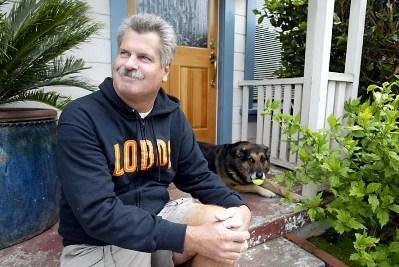 Mark lives in Santa Cruz, CA, and is being treated at Stanford University Medical Center. *Please check out the article on Mark in our local daily paper by going to www.santacruzsentinel.com. Go to archives and type in May 8,2007 then hit the “Santa Cruz Style” tab and Mark’s article ought to be the 1st thing that comes up. If not, it was written by Peggy Townsend and the column is called “Name Dropping.” The new photo was taken by Bill Lovejoy, who is long time employee of the Santa Cruz Sentinel and has been taking pictures of Mark since he was a high school pitching all star! Thank you Bill for letting us use your photo!.. And for all your kind words and efforts on Mark’s behalf! Mark & I attended his 30 year high school reunion (SLV) in June. With a lot of help from his classmates I was able to hold a Silent Auction there. We raised over $3000 for Mark! His classmate, Stacy Leib and friends created a special DVD montage of all their classmates and were generous enough to donate all proceeds from the DVD sales to Mark! Special thanks to Eddie Jeness who spearheaded the reunion and helped me to contact everyone from SLV High Classes 1976 – 1978! 8042 Soquel Drive in Aptos on Tuesday, September 18th at 6:00pm. Passed hor’s douevres will begin at 6pm with a three course dinner following. Wine will be served throughout the evening. Please see the ad below for more info. Look for the ad in Metro Santa Cruz Newspapers from August 22nd – September 5th and listen for an ad on our local radio stations which include KPIG 107.5 FM, The Beach, 101.7 FM & KBOQ 95.5 FM. KPIG also broadcasts into San Luis Obispo, San Francisco and Chico! Keep your ears open for a “Live Hog Call” about this special dinner to benefit Mark. The cost is $250 per person. Please prepare to make payment to Café Sparrow on the night of the event by check or credit card. All reservations, questions etc. should be directed to Alice Colby by email (preferably) at [email protected] or by phone at: 831-212-6593. Please talk slowly and slowly leave a return phone number for me to confirm your reservation with you. Seating is limited to 60 people. We really hope you can attend. Remember this is for a really deserving guy. Not only are you doing a really good deed, but you get to enjoy an amazing dinner! Café Sparrow is an award winning restaurant, well known for its excellent cuisine. Owners, Bob & Julie Montague, have very generously donated their restaurant & time as well as all the food & staff. The price includes tax and tip which the Montagues are also covering! Cafe Sparrow was a wildly successful fund raiser thanks to the generosity of so many! We are still overwhelmed with what a great evening it was and how many wonderful people are in our lives! Special thanks to all of you! We hope to have another fund raiser by the end of the summer 2008. Alice Colby, Santa Cruz, CA.